All emails sent to your Hotmail address are sent only to yourself, and only to that email address; the only case where an email sent to you goes to other addresses as well is when the email had multiple recipients. But Windows Live Hotmail lets you setup email forwarding on your account, and to any other email address (Hotmail address or anything else). 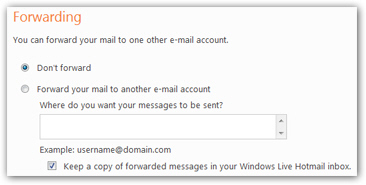 This tutorial will explain how to setup mail forwarding for your Hotmail account, and how to disable it after the fact. Email forwarding is actually a good alternative you should consider to permanently closing, or deleting, your Hotmail email account, since you can always go back to using Hotmail should you decide so. To configure your email forwarding settings and options in Windows Live Hotmail, click on the Options menu near the top right corner of the screen: once the menu opens, click on the last item, "More options" to load all customizable Hotmail settings. Under the first group of settings in the Hotmail Options screen, locate the link labeled "Forward mail to another e-mail account", and click on it. Hotmail will load the Forwarding screen, which contains the email forwarding settings you can customize: notice that, by default, the Don't forward option is selected; this means that your emails are never forwarded anywhere else unless you explicitly configure that feature. To forward your Hotmail emails to another address and email account, click on the Forward your mail to another e-mail account option. Note that by default, your original Hotmail account will keep a copy of each email it forwards. We will show you further down how to forward mail and delete the original copy of each email (an desirable option to avoid running out of storage space, especially if you are using mail forwarding as an alternative to closing your Hotmail account). Forward your Hotmail emails to Gmail — To setup mail forwarding for emails from Hotmail to Gmail, simply enter your Gmail email address in the message forwarding field. Make sure that there are no typos in your Gmail address: otherwise, your forwarded emails will either be lost, or forwarded to another, puzzled Gmail user! Forward Hotmail emails to Yahoo! Mail — Likewise, to have your Hotmail emails forwarded to another Yahoo! email address you use, simply specify the Yahoo! email address in the message forwarding text box. Here too, ensure that your Yahoo! Mail email address is properly typed to avoid having your forwarded emails misdelivered or not delivered at all. Gmail, Yahoo! Mail, or any other email address / email provider you want to use is fine: Hotmail will forward the emails it receives as normal emails, just like you would receive emails in your Gmail / Yahoo! Mail account. Before fully relying on the Hotmail mail forwarding feature, we recommend that you set Hotmail to retain a copy of the emails forwarded, at least until you have confirmed that they are properly forwarded, and to the right email address (more on this setting below). Next time you want to turn back on email forwarding, you will simply select the Forward your mail to the following email accounts option, without having to once more type the email address to which you want to forward your Hotmail emails. If you had Hotmail configured to forward your emails to Yahoo! Mail or Gmail, note that this will stop happening with no notice from Gmail or Yahoo! Mail - just remember to turn mail forwarding back on, or manually forward your Hotmail emails, to keep receiving them in the account inbox of your Gmail / Yahoo! Mail email address.